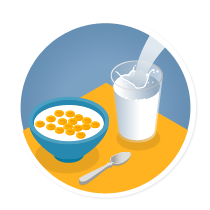 Milk and other dairy products are a great balance of protein, fat and carbohydrates. Milk happens to also be an excellent source of essential nutrients such as calcium, riboflavin, phosphorous, vitamins A, D and B12 not to mention pantothenic acid. No wonder it has earned the reputation as an excellent source of nutrients for healthy teeth and bones. Full cream – Full cream milk contains around 3.4g fat per 100ml. We recommend full-cream milk for children from age one to three years. Flavoured milk – These types of milk can either be full-cream or low fat, but most varieties contain a fair amount of sugar. UHT (Ultra-high Temperature-treated) milk – Ultra High Temperature. Milk is treated to last for long periods of time without refrigeration. The milk goes through a process called homogenisation to distribute the milk fat content evenly throughout its liquid content, thereby preventing the milk fat which is lighter than the rest of the milk, rising to the top of the milk. The milk is then heated to a very high temperature of almost 140 c for a period of 2 to 4 seconds then immediately cooled to a temperature of 20 c. The heating process kills off all bacteria present in the milk, and if the milk remains sealed once it has been specially packed, it will remain fresh for many months without refrigeration. Lactose-free – Lactose-free milk starts out like any other variant; in a farmer’s green pasture. The only difference is that an enzyme, lactase, is added so that people with lactose intolerance can enjoy more without any of the unpleasant side effects. Milk and other dairy products are one of the best natural sources of calcium. Just three servings of dairy (a glass of milk, a small tub of yogurt or a small piece of cheese) will provide all the calcium most people will need in a day. Numerous studies examining the role of diet and cancer have not shown any link to dairy foods. In fact, milk may actually have a protective effect against some types of cancer. There is also a lot of evidence that suggests high-calcium diets (including milk and dairy products) can actually lower your risk of colon cancer. In a recent study, men who drank more than 1 and a half glasses of milk per day lowered their risk of developing colon cancer by 33%. There is also exciting preliminary data suggesting that drinking milk can lower the risk of breast cancer. There’s a common misconception that milk and dairy products contribute to weight gain and obesity. Recently, researchers found evidence that shows dairy could even control your weight. After childhood, some people lose the ability to digest lactose, a sugar found naturally in milk. To learn a bit more about lactose intolerance, click here. A 10-year study of 3 000 overweight adults found that consuming dairy products like milk, instead of refined sugars and carbohydrates, may help protect overweight young adults from developing type 2 diabetes. There is no evidence to suggest that milk or dairy products cause acne or aggravate it. In fact, there isn’t even convincing evidence to show that chocolate and fried foods such as chips cause spots. Genetics, hormonal imbalances and skin type are rather cited as the main reasons for acne.